In the fast-paced world that we live in today it can sometimes be difficult to find time for ourselves. And even when we do manage to find a few minutes of peace, how often are we really in the moment? Sharon Loves Yoga classes give us the opportunity to truly experience what it means to be present in body, mind and spirit. Whether you are looking for a constructive way to relieve stress, recover from an injury, improve your physical or emotional wellbeing, find some reflective time for yourself or simply enjoy a new experience I recommend attending her classes. Prana Flow Yoga classes with Sharon are a great way to improve your wellbeing. There are so many different types of yoga that it can be hard to know which one will be right for you. Prana Flow Yoga as described by its founder Shiva Rea is, "an energetic, creative, full-spectrum approach to embodying the flow of yoga." My experience of this type of yoga with Sharon is both a fluid and dynamic practice; whereby states of physical and emotional equilibrium are achieved through deep breathing. Each movement connects to the preceding one in such a way as to create a moving meditation, which calms and revitalises you both mentally and physically. Synchronise your movement with your breath and feel the benefits. The beauty of Prana Flow Yoga is that it synchronises movement with breath, so that each movement simply flows onto the next one. I found this to be a much more natural style of yoga than some of the others I have experienced. Sharon uses a combination of movement, breathing, music and visualisation to lead you through the practice in order to develop your flexibility and strength. Furthermore, she expertly guides you through the movements so you never feel like you are struggling or out of place. This is really important when some of the positions might be new or complicated. You will experience the full spectrum of yoga practice at these classes. Sharon's love of yoga is evident and it is infectious. In fact, my sessions with her have become such an important part of my week in the few months that I have been practicing. These yoga classes will provide you with a space you can go to clear your mind and attain a sense of release through introspection. "Yoga can help you find the counter-balance to what is happening at work or at home," Sharon said. The ability to cultivate this physical and mental equilibrium can be challenging at times, yet ultimately rewarding. And with Sharon's guidance it is achievable. Have fun while challenging yourself. Her style of teaching and ability to share her knowledge so well can be ascribed to her extensive background in yoga. For over ten years Sharon has been training and developing her yogic practice. Having trained with both Shiva Rea and Universal Yoga master Andrey Lappa in Singapore, she is able to draw inspiration from these experiences to offer us a holistic yoga practice. We are lucky to be able to enjoy the full spectrum of yoga practice as a result. Finding this time for yourself is an "essential luxury" according to Sharon. Fortunately, there are lots of ways you can work a class into your schedule. Sharon will guide you through the moves so you can achieve the results you want. Sharon offers a range of class types to suit different requirements. Firstly, there are general group classes that you can attend at various locations around Brisbane's north side. Check out her website for class times and locations. Alternatively, if you would prefer a more tailored approach, you can organise private lessons to suit your individual requirements, lifestyle and resources. Furthermore, she leads Corporate Health and Wellbeing Programmes. Therefore, if you think your workplace needs a greater sense of calm and connectivity, why not organise a class? Develop your practice at your own pace with Sharon. Regardless of how and when you choose to practice with Sharon, she will always ensure that you develop your practice according to your ability. 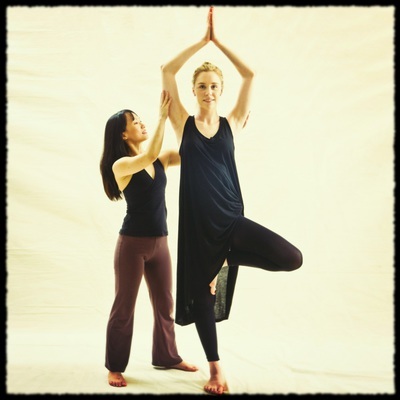 Prana Flow Yoga with Sharon is a wonderful experience and a fabulous opportunity to develop yourself physically and mentally. You will find the classes not only challenging and uplifting but also highly enjoyable. They are a fabulous way to build strength, balance, energy and focus in all aspects of your life. Attend a class and find out exactly why Sharon loves yoga. Sharon loves yoga and you'll love it too.